Jeff Smith, who owns Twin Oaks Farms north of Eagle, Idaho, has been concerned about farmland loss in the area. The trees in the distance are part of residential developments. 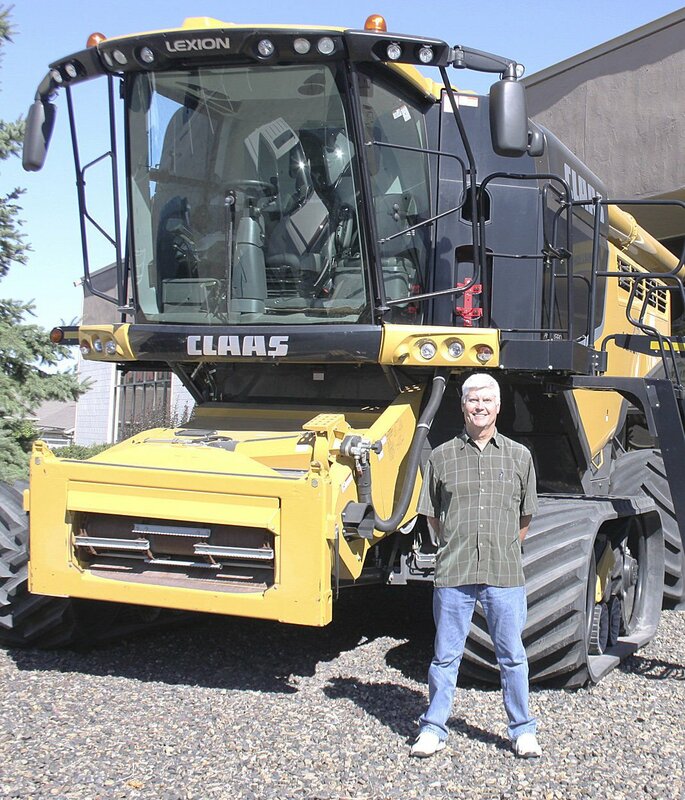 Mountain View Equipment Service Manager Gaylan Moore says the Meridian, Idaho-based store expanded into rural areas as farms became rarer near Boise and the industry moved toward high-capacity harvest machines suited best to bigger producers. Eric Adolfson, principal planner, Community Planning Association of Southwest Idaho. Roger Batt, Canyon County Farm Bureau representative on a county committee exploring strategies to preserve farmland. Part of a farm parcel in northwest Meridian, Idaho, proposed for development. Sadie Carney, Oregon Department of Land Conservation and Development rural policy analyst. A high mound at Twin Oaks Farms north of affluent Eagle, Idaho, offers an expansive view of the growing greater Boise area — including miles of once-productive farmland that has sprouted houses, trees and big yards. Farmland preservation concerns individuals and organizations in the fast-growing Boise area. Historically agriculture-heavy Canyon County, immediately to the west, recently formed a committee of stakeholders to study how to preserve farmland as the area continues to grow. Roger Batt, who lives in western Canyon County, has been advocating farmland preservation in southwest Idaho for years, first by co-founding a coalition of agriculture interests and now by serving as the Canyon County Farm Bureau’s representative on the county’s new Agricultural Planning Area Committee. “The major concern I have been hearing is from our seed industry,” said Batt, executive director of the Idaho-Eastern Oregon Seed Association. Canyon County is a top-five producer of seed in the world, growing about 50 species of seed crops including hundreds of varieties and shipping to 120 countries, he said. They include radish, carrot, turnip, sweet corn, peas, alfalfa, clover and turfgrass seed, among others. But the amount of farmland available to grow those crops is shrinking at an alarming rate, following the Boise area’s push toward development. In the next seven years, Canyon County’s farmland will shrink by an estimated 5.9 percent, according to the county. Instead of 84 percent of the county, productive farmland will represent only 79 percent, Batt said. Seed producers are concerned about aggregate land loss and being left without the quarter-mile to two-mile spaces between fields they need to prevent cross-pollination. Ben McIntyre, whose family farms between Caldwell and Marsing and operates a custom hay business, agrees it’s logistically more challenging. McIntyre Farms often takes its hay-processing equipment on the road to service other growers. Development has not had a major impact on McIntyre Farms’ main site but has made it tougher to operate on ground the farm leases elsewhere in the county. McIntyre said it’s harder to get to the leased fields, and in and out of them, with equipment. Finding suitable ground to rent is also more difficult. Support businesses have had to adopt, too. Local farmland loss over the past 20 to 30 years was a factor in Meridian-based Mountain View Equipment’s move to add locations in more rural areas, service manager Gaylan Moore said. Mountain View specializes in hay and forage equipment. As farmland around the Boise area changed to other uses, so did the company’s clientele and the mix of equipment it sells and services. Moore said small dairy farms became fewer locally. Mountain View opened or bought dealerships closer to where large farms are more common, such as Homedale, Fruitland, Jerome and Idaho Falls. “Right around here, there isn’t much cropland any more,” he said from Meridian, where the company now sells more compact tractors and a few loaders suited to smaller operations. In Canyon County, Batt was involved with an earlier coalition that recommended the county adopt zoning standards to reduce the amount of farmland available to development. County commissioners ultimately rejected the standards as too strong and infringing on private property rights, he said. The new committee aims to discuss the importance of protecting farmland as well as property rights, and develop language for the agricultural component of the next 10-year comprehensive plan, he said. “It is more of a well-rounded focus group: producers, ag businesses, developers, municipalities and planners,” he said. A Canyon County draft map shows proposed planning areas and two “agricultural belt” areas in the county’s northern and southern stretches — mainly north of the Boise River and south of Lake Lowell, respectively. The map will be used in updating the comprehensive plan. The committee is starting to review current land-use designations, growth projections and land-use policies. “The northern and southern ‘ag-belt’ areas have minimum growth in population and jobs until the year 2040, and we will be looking at how the county can encourage continued and increased investment in agriculture in these areas,” said Canyon County Development Services Director Tricia Nilsson, who leads the committee’s meetings. It will be four or five months before the committee produces recommendations for public comment, she said. She said the amount of dry grazing land in the county decreased in the past 10 years, but not irrigated farmland, according to data on parcels that qualify for the state’s agricultural exemption. The exemption reduces the property tax on land used for agricultural production. Nilsson said the continued strong presence of irrigated farmland over the decade could reflect good commodity prices at times and, more recently, demand for productive farmland among investors. Meanwhile, some dry grazing land may have been deemed more valuable for other uses. Statistics provided by Canyon County show that between 2007 and 2017 the total land receiving the agricultural exemption decreased by 0.84 percent, from 262,559 acres to 260,341. The number of irrigated acres actually increased 1.7 percent, from 203,410 to 206,830. The number of dry grazing acres, however, dropped by 15.4 percent, from 35,968 to 30,418. Ada County, of which Boise is county seat, reported that from 2007 to 2017, total land receiving the agricultural exemption dropped by 1.8 percent, from 185,330 acres to 182,061. The number of irrigated acres dropped by 3.3 percent, from 60,686 to 58,649. Dry grazing acres held steady at 116,364.49. But the data may not immediately reflect the agricultural land earmarked for development. The agricultural exemption may have been lost since then or farmland may have been annexed. In addition, developers will often rent out newly acquired agricultural land to farmers until they are ready to build on it. If an owner is holding property for development in 5 to 10 years, for example, he may lease it to an established farmer and qualify for an agricultural exemption, decreasing property taxes, said Brad Smith, chief deputy in the Ada County Assessor’s Office. “We see a handful of developers who are pretty savvy,” he said. Sid Freeman, who farms north of Caldwell in Canyon County, advocates preserving agricultural land as well as owners’ property rights to change uses by going through established, formal processes. “The most important thing we talk about in farmland preservation is preservation of the farmer,” he said. Making money farming leaves the farmer less likely to sell, but those who aren’t making money or who have other needs should be allowed to seek a new land-use designation through an established process to sell at the best price, Freeman said. His family farms on a mix of owned and leased ground. The family aims to sell — as small-farm sites — a portion of the land it owns to help his parents retire. He will keep farming. Freeman said southwest Idaho has many examples of a farm’s financial position improving because the older generation sold some land and directed a portion of the proceeds to the younger generation. “We need to do what is in the best interest of preserving farmers as well as farmland, and if we have to sell some land for development in order to do that, that is what we need to do,” he said. Municipalities and some other members fund the Community Planning Association of Southwest Idaho, which tracks the amount of farmland, its location and quality as well as recent and anticipated development. The association also tracks the arrival of new residents and where they’re moving, housing density, jobs and other measures. It uses the information largely to anticipate growth and plan for meeting transportation needs for the next 20 or more years. Eric Adolfson, the association’s principal planner and geographic information systems coordinator, said part of the association’s long-range plan “talks about agriculture and basically encourages growth within existing footprints.” Goals include improving transportation while minimizing sprawl and farmland encroachment. Idaho’s 1975 Local Land Use Planning Act requires cities and counties to develop comprehensive plans and zoning ordinances, but offers little direction on how the requirements should be met, a Boise State University Public Policy Center report said. Regulation of development is generally more stringent in Washington, and especially in Oregon. Washington’s Growth Management Act includes provisions for counties to designate agricultural lands of long-term commercial significance, “meaning keeping them as ag lands,” said Josh Giuntoli, coordinator of the state’s Office of Farmland Preservation. “And they have allowed uses, which may preclude turning a parcel into home sites … those are defined locally,” he said. A statewide grant program helps qualifying Washington entities buy permanent easements that are legal encumbrances saying the land must be used for agriculture permanently, he said. Several counties in the Puget Sound area use local funds to acquire development rights and in turn keep land agricultural. Additionally, Washington voters in the early 1970s established an open-space tax program giving landowners a property tax break for enrolling their agricultural properties — and significant penalties for removing them. Exclusive Farm Use zoning in Oregon greatly limits development outside a city’s urban growth boundary. EFU criteria also include soil quality and other productivity measures. “We go to some length to protect our high-value farmland in this state,” said Sadie Carney, Oregon Department of Land Conservation rural policy analyst and communications manager. For example, owners of EFU-zoned land can’t subdivide it into lots of less than 80 acres west of the Cascade Range and less than 160 acres on the more sparsely populated east side, she said. An owner wishing to build a house on EFU land must pass an income test that shows he or she is actively farming the land. Some other types of dwellings are allowed on farms, subject to restrictions. “This would prevent somebody who just had money to spend from taking our land out of production so they could put up a mansion,” Carney said. Smith, who raises crops and livestock north of Eagle, is concerned about nearby residential development, and the loss of some irrigation infrastructure that cannot be replaced. 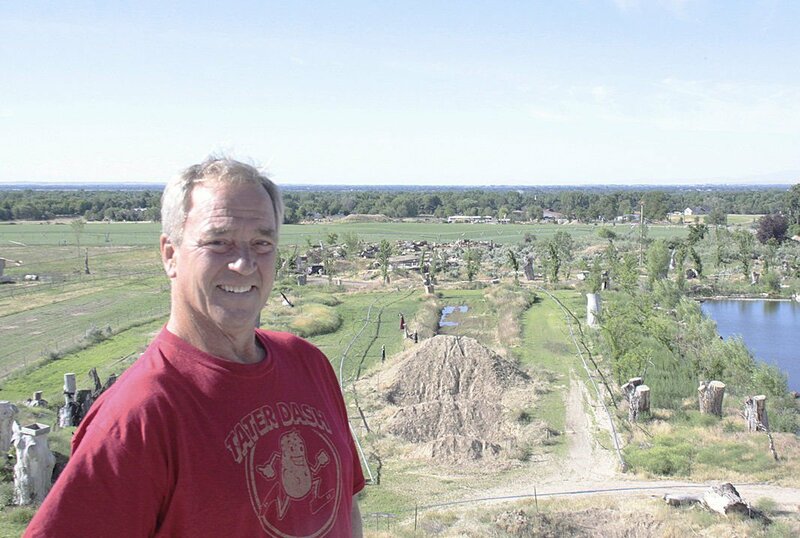 Smith, a former wildland firefighter, has a degree in wildlife biology and also studied landscape architecture. Smith figures 900 homes could fit on his 200-acre Twin Oaks Farms, but he plans to put the property into a conservation easement to keep it agricultural.